Legendarily, the word Tagaytay came from "TAGA" meaning to cut and "ITAY" which means father. A father and son were said to be on a wild boar chase when the animal they were pursuing suddenly turned and attacked them. 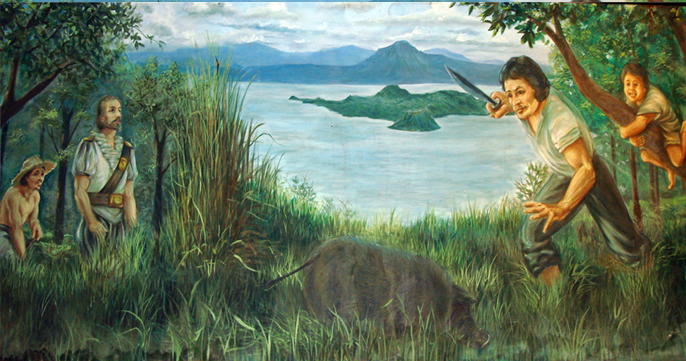 Fearing for his father's safety as the boar violently charged the old man, the son cried out "TAGA, ITAY!" which means "cut him down, father!" The son"s exhortation and shouts reverberated in the valleys of the ridge and were heard by the residents, wood gatherers, hunters and kaingeros in the forests. Thus, the shout and the words Taga, Itay became the subject of conversation among the people in the countryside for several days. In time, the place from where the shouts came began to be known as the beautiful southern city of Tagaytay. During the Philippine Revolution of 1896, Tagaytay became a place of refuge and hideaway for revolutionaries from the nearby provinces of Batangas and Laguna and other neighboring towns of Masilao (now Amadeo), Malabon Grande (now Gen. Trias), Silang, Dasmarinas, Mendez and Indang. Its central location amidst these towns and provinces, the wild preponderance of forests on its ridges and the vast undulating topography of its lands characterized by wide stretches of cogon offered a ready sanctuary and haven from pursuit of the Katipuneros. As a passageway for the revolutionary activities in the said provinces, the natives and revolutionaries described movement to and from the towns via Tagaytay with the word "MANANAGAYTAY," which means traversing the ridges of Tagaytay. At the outbreak of the Second World War, the 11th Ariborne Division of Lieutenants General William Krugers 8th Army airdropped military supplies and personnel on the Tagaytay ridge, prior to the Liberation of Manila from the Japanese on February 3, 1945. To commemorate this event, the city officials, in coordination with the Philippine Historical Institute installed a marker at the junction of the Silang-Canlubang-Nasugbu roads. On June 21, 1938, Tagaytay became a chartered city with the passage and signing by the late President Manuel L. Quezon of Commonwealth Act No. 338, a bill authored by Rep. Justiniano S. Montano of Cavite. Among the city's past mayors were Arsenio Natividad, Mariano Bondoc, Melchor Benitez, Miguel Tana, Isaac Tolentino, Hilarion Maglabe, Benjamin Erni, and Francis Tolentino. The incumbent City Mayor is Hon. Abraham N. Tolentino. Today, the City of Tagaytay is identified as one of the priority areas for tourism development of the Department of Tourism. Likewise, the city has been identified in the CALABARZON as a tourist center. Tagaytay City has evolved tremendously since it first became a City in June 21, 1938 by virtue of Commonwealth Act No. 338. It is a component city of the Province of Cavite. It has a total land area of 6,500 hectares with a total population of 62,030 and a total number of 13,150 household as per NSO report of 2010. Politically subdivided into 34 barangays, it is now classified as a Second Class City as declared by the Department of Finance. Tagaytay can be best described in two distinct perspectives. First, in the national perspective, the city has become a major national tourist destination mainly because it affords the best advantage point of Taal Lake/Volcano; its accessibility and proximity to Metro Manila and its cool climate. In the past decade, the area covered with residential and commercial developments have doubled and everything indicates that this trend will continue. Renewed interests of local and foreign investors have already ushered in the entry of major large scale developments in the city. In the regional perspective, the region has become one of the fastest urbanizing areas in the country. It is further shaping up as one of the country's industrial centers in the 21st century. Its growth has mainly been determined by policy directions and market preference given its strategic situational advantages. Thus, the recent years have exhibited a rapid rise in the development of industrial estates, housing, leisure facilities, regional shopping centers, etc. A great majority of these have occurred in former agricultural areas which were readily accessible. As urbanization accelerates, concerns on transport, the environment, water supply, waste management, agricultural production, land management, etc., have also arisen. The city has been in the midst of all these developments, though its land limitations have not caused its urbanization to be as rapid as compared to the nearby lowland towns. As the city's natural character is well- suited for rest and relaxation, the development of high-cost, week-end housing areas occurred complementing the working centers such as Metro Manila and some of the nearby towns in Cavite and Laguna. This type of development has even spilled-over to the adjacent highlands towns with a similar view of the lake as prime land (ridge) in the city has become scarce and expensive. Further, other large leisure facilities such as resorts, hotels, mall, etc. are coming up as the private sector cashes in rapid urbanization of the Region and city's comparative advantage as a recreational center. Thus at the National and Regional levels, the city's role as a major tourist destination has been firmly established.